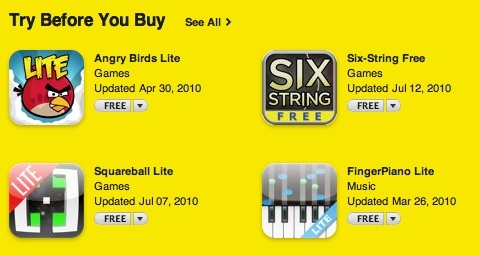 Apple has added a section to the App Store entitled “Try Before You Buy.” This section highlights the free versions of for-pay applications. It’s a smart move by Apple and will likely quiet those who claim that Apple doesn’t allow developers to offer application demos. But for me, this new section only helps to point out a major problem with the App Store, there is no way to link a for-pay version to a free version of the same app. What I mean by that is that the App Store doesn’t “know” that those two applications are actually two different versions of the same app. It would be great if the App Store displayed a download button for the free version on the for-pay application’s page. Maybe Apple could get rid of the free/lite application’s page altogether and just have one page that displays download buttons for both apps and a brief description of the limitations on the free version. It would result in significantly more downloads in the App Store (by me at least) and would help clean up the place a little bit. It’d be nice if you could separate lite applications with for-pay version from applications that are simply free — I’ve actually found myself looking for a “pro” version to an application that was only offered for free. Apple could even take it a step further and allow developers to build the free and for-pay applications as a single bundle. Customers could either purchase the application outright or download the free version with the option to upgrade through an in-app purchase. All of these suggestions would make the App Store a better place for both developers and customers, but honestly I’d just be happy if developers could link the for-pay app to their free/lite app so that you wouldn’t have to perform an App Store search to find your current app of interest’s free version.